IS SOUND BEHIND THE CREATION OF CROP CIRCLES? by Freddy Silva. From an upcoming article in Atlantis Rising magazine by Freddy Silva. For over twenty years the normally quaint and quiet English countryside has slowly been overrun by a phenomenon more akin to 'It Came From Outer Space' than to cream tea. Fields long accustomed to entertaining wheat, barley or Canola are, with increasing frequency, playing host to magnificent pictograms in the form of crop circles: areas of flattened crop as large as 100,000 sq. ft. where plants are bent an inch above soil level and gently laid down in geometrically-precise pictograms, with no visible signs of damage or human entry. But what started as a local phenomenon in the environs of Stonehenge and Silbury Hill has since become a major British export: to date, some 8000 crop circles have been reported worldwide. If they had their way, certain television documentaries would have you believing that all crop circles have been nothing more than the work of two simple, elderly men armed with a plank of wood and a baseball cap fitted with a ludicrous wire attachment which, they claim, helped make mathematically-correct circles and ruler-straight lines in total darkness. But in these programs the meat on the bone of research is systematically stripped before reaching the table and what the public is left with is an opportunity to be turned off in the face of a human agency being presented which seemingly explains the whole phenomenon. 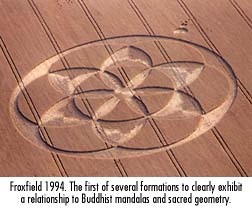 This is why there is so much disbelief, even hostility, towards crop circles in the public's eye. Yet despite consistent attempts, researchers, scientists and hoaxers have failed to replicate all kinds of phenomena associated with genuine crop circles: plants bent, not broken or damaged, radically-altered chromosomes, massive depletion of the watershed, soil element alterations, major discrepancies in background radiation and electromagnetic fields, dowsable and long-lasting energy patterns, and so on. Most disturbing for hoaxer advocates has been the discovery by Emeritus Professor of Astronomy, Gerald Hawkins, of Euclidean geometry and diatonic ratios present in crop circles, features requiring a familiarity beyond basic math and yet to be found in both controlled man-made designs or uncontrolled hoaxes. So much, then, for two guys and a large two-by-four. But what, then, is causing several thousand square feet of crop to suddenly lay down in designs of immense complexity and hypnotising beauty? When cutting the stems of affected plants, a malty fragrance is detected suggesting that they have been 'cooked' from the inside. Yet they remain unharmed. A second ground observation reveals that a noticeable amount of ground water in and around crop circles appears to have vanished (this is corroborated by my infra red photographic analysis); the soil within a formation is generally dry, even cracked, despite overnight rains. Exhaustive lab analysis into hundreds of crop circles from 1991-95 by biophysicist Dr. W.C. Levengood reveals physical and biophysical changes in plants inside crop circles: their nodes are literally blown open to form ``expulsion cavities,'' an effect unique to crop formations and reproduced in a lab setting through ``a very rapid rate of heating.'' Levengood also discovered alterations in the germination and development of seed embryos, alterations in plant stem node length and circumference (up to 200 per cent in one case), and enlarged cell wall pit diameters in bract tissue- actions consistent with the application of intense heat. This leads to the speculation that the affected plants are 'microwaved' for a very intense, yet brief period of duration. The ground water is partly vaporised, partly sucked into the plant thereby preventing the field from catching fire while the stems are made supple enough to bend without cracking, enabling them to be easily manipulated into precise patterns. But this does not account for the geometric designs. Look through 20 years of aerial photos of these agriglyphs and it is hard to deny their melodic precision, their circular forms resplendent with abstract, yet harmonic waves of invisible energy. 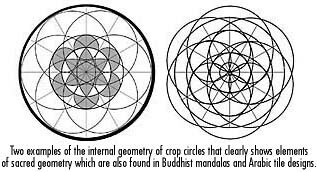 Hardly surprising, then, to discover crop circle designs flaunting the principles of sacred geometry, either visually or veiled within the construction blueprint, much in the same way ancient esoteric knowledge was hidden within the framework of religious fables or monuments. In his visionary work, The Sophistication of Agriglyth Geometry, John Martineau was perhaps the first to visualise this coded information in the early phases of the phenomenon; my own dissections of aerial photographs also prove the same to be true of designs in recent years. Even what sometimes appear to be loose or random elements both within and beyond the perimeter of formations- such as small unconnected circles or 'grapeshot', and rectangular boxes- are placed along an invisible matrix of pentagonal and hexagonal alignments based on proportional geometry and Golden Mean ratios. 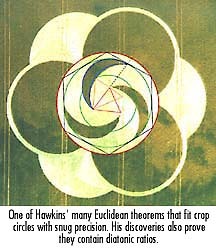 In Science News (Feb. 92), Prof. Hawkins went a step further by using the principles of Euclidean geometry to prove that four theorems could be derived from the relationships among the elements in crop circles. More significantly, he discovered a fifth theorem from which he could derive the other four. Despite an open challenge, tens of thousands of subscribers to both Science News and Mathematics Teacher were unable to create such a theorem, which Euclid himself had only hinted at twenty-three centuries earlier. It subsequently appeared as flattened barley at Litchfield, England, in 1995. Ancient Greeks once remarked that "geometry is frozen music". To their Egyptian teachers, sacred geometry and music were inextricably linked since the laws of the former govern the mathematical intervals that make up the notes in the western music scale- the diatonic ratios. Coincidentally, Hawkins' Euclidean theorems had also produced diatonic ratios. So for the first time, geometric theorems were linked with music and crop circles were proved to contain musical notes, which are themselves the by-product of the harmonic laws of sound frequency. The fields themselves offered blatant clues pointing to a sound component. In 1996 a crop circle demonstrated the combination of two important figures, the 3, 4, 5 triangle and the Golden Mean, which gives us the diagram necessary to produce musical ratios (as exemplified in The Divine Proportion by H.E. Huntley). Then, an outstanding formation at Goodwood Clatford- which had its plants bent six inches from the top - gave the proverbial nod to sound. For here was a representation of a cymatic pattern in 5000 sq. ft of barley. And it led straight to a smoking gun. In 1967, Swiss scientist Hans Jenny published the first of his painstaking studies of the vibrational affects on physical mediums such as water, plaster, oil and sand- Cymatics. By transmitting sound in the shape of a monitored frequency through these elements he was able to capture on film the exact geometric pattern that sound makes as its vibrations move through these substances. Changing the vibration altered the shape of the geometry captured in the receiving substance- a low frequency produced a simple circle encompassed by a ring, whereas a higher frequency increased the number of concentric rings around a central circle. As the frequencies rose so too did the complexity of shapes, to the point where tetrahedrons, mandalas and Pythagorean forms could be discernible. Jenny not only managed to solidify sound, he also enabled humanity to observe frozen music. 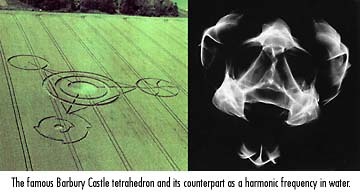 Jenny also provided a physical connection to the creation of crop circles since many of the vibrational patterns found in his photos mimicked their designs. 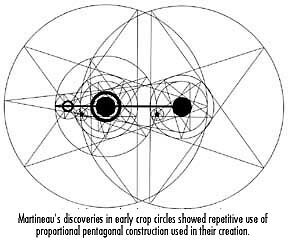 Some were blatant imitations, such as a circle surrounded by concentric rings from the 80s, the tetrahedron at Barbury Castle in 1991, the mandalas and spider's web of 1994, even the highly structured Pythagorean-based star fractals of 1997. 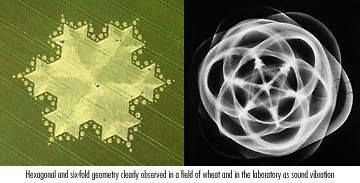 Other photos demonstrated the construction geometry encoded within crop circles but only visible upon dissection of overhead photographs by compass or computer. But there is yet another coincidence: the relationship between the rising complexity of Jenny's cymatic geometries in proportion to the rise of dispensed frequency matches the historical sequential development of the pictograms. Crop circles began appearing as simple circles in the 70s and developed in an exponential curve through the 80s and into today's complex pictograms, much in the same way Jenny's work shows the increase in design complexity relative to the rise in frequency applied. This coincidence echoes the repeated claims by many channelers/mediums/sensitive people at the beginning phase of the phenomenon that the Earth is undergoing a change in frequency- a raising in the Earth's vibrationary rate, a sentiment also shared in the prophesies of native tribes around the world concerning Earth changes of this period. Further corroboration comes from NASA whose recent soundings of Earth from space record a rise in the frequency 'hum' emitted by the planet. In his extensive database, leading crop circles researcher Colin Andrews notes several accounts of a trilling sound heard by people prior to witnessing crop circles forming. 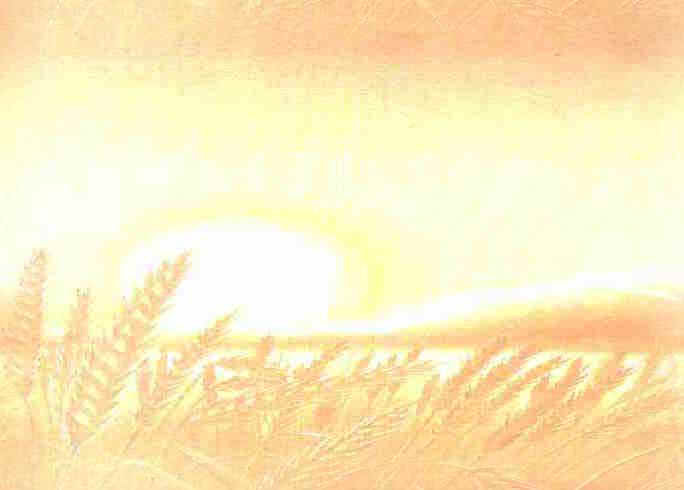 The reports describe a total stillness in the air; the morning song of birds stops, proceeded by a trilling sound and the banging together of wheat heads despite an absence of wind. The crop then lays down in spiral fashion, the whole episode lasting no more than fifteen seconds. This sound was eventually captured on magnetic tape and analysed at NASA's Jet Propulsion Lab as mechanical in nature and beating at a frequency of 5.2kHz. The same sound had been previously heard by a BBC cameraman whilst recording an interview near a crop circle, shortly before crossing the formation's threshold which proceeded to render two $50,000 TV cameras obsolete. Obviously, if sound is a main component in the creation of crop circles it can certainly be interacted with. The formations' physical location may play a part in this. In Dowsing Crop Circles, two decades of collective research by noted dowsers Richard Andrews and Hamish Miller, among others, reveals that crop circles have been materialising over major ley lines- the Earth's magnetic energy grid- or their tributaries. Miller had also observed, together with Paul Broadhurst in The Sun and the Serpent, how this energy congregates at stone circles and tumuli. Imagine his surprise to find crop circles energetically linked to these ancient sites and their magnetic grid. In noted cases, such as the cyclopean triple Julia Set fractal formation at Windmill Hill in 1996, crop circles appear over the node point where the male and female lines intersect and discharge dowsable patterns of energy. These invisible fingerprints, which can last up to a year after all visible signs of the formation have been tilled, were discovered by Miller to have coherent geometric structures- Teutonic crosses, 9-, 10- and 12-pointed stars, the same geometric patterns which formed part of esoteric mathematical teaching in Egyptian, Buddhist and Arabic cultures, and since popularised in the West by Pythagoras. This relationship between geometry, math and music is especially important in Buddhist mandalas, whose elaborate geometries are claimed to be the physicalization of chants which are then used for meditation. In Arabic culture these relationships have been meticulously preserved in ceramic tile design. In both cases, the geometry mirrors crop circle designs in either their outward appearance or in their respective construction skeleton. Which, in turn, bear a familiarity to Jenny's photographic evidence. 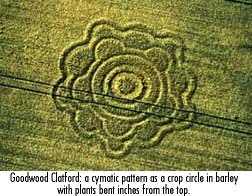 It's no coincidence that a large percentage of crop circles can be identified with ancient cultures. To this day their histories are honoured through song and music, their healing rituals performed with sound or rhythm. In 'Secrets Of The Soil', Peter Tomkins reveals how Hopi natives danced in a field during a severe drought, chanting specific notes. By harvest time the only area in the vicinity to yield a harvestable crop was the one exposed to their vibrationary tones. A parallel situation exists in England where farmers whose fields have played host to genuine crop circles report an increase in yield and healthier-looking, pest-resistant plants. As Robert Lawlor once wrote in Sacred Geometry, "Both our organs of perception and the phenomenal world we perceive seem to be best understood as systems of pure pattern, or as geometric structures of form and proportion. Therefore, when many ancient cultures chose to examine reality through the metaphors of geometry and music they were already very close to the position of our most contemporary science." The musical scale, constructed on the harmonics of sacred geometry, and now found within the framework of crop circles, represents the mathematical structure of the soul of the world because it embodies the essence of the universe modelled on it. Could it be, by implication, that crop circles are the universal language? In them we see the embodiment of musical and geometrical elements as they give rise to designs of perfect symmetry, proportion and harmony. This may explain why people just aren't as aroused by man-made formations regardless of how coherent they look, especially from the air- their ratios are off the mark and fail to activate a harmonic vibration within the viewer. The same applies to a genuine crop circle: distort or remove just one element and the communication between viewer and design is short-circuited. It simply becomes a work of art without meaning. But show people a mere photo of the real thing and their eyes light up, they become emotional, light-headed, ecstatic, benevolent, dizzy, even noxious. In stark contrast, a hoaxed crop circle provokes apathetic, even negative reactions. Perhaps what the recognises is a basic language common to all nature but only retrievable by the subconscious. Our eyes may be attracted to the designs in golden wheat but the real message is reached at a deeper level, triggered by an underlying code based on sacred geometry- the very same code upon which nature is created, and whose formulas were zealously guarded by ancient esoterics as the knowledge of the Godly. What we are reading in the fields of England- and now throughout the world- could very well be the book of Universal Law. Text � Freddy Silva 1997. No reproduction without prior permission. Images � Freddy Silva, Colin Andrews, Keith Critchlow, Hans Jenny, Steve Alexander, Calyx.